Christmas A to Z (2016) is a delightful book for children. 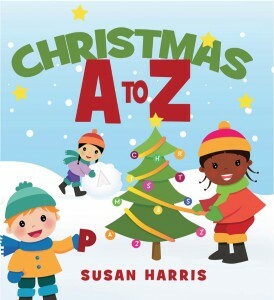 Susan Harris gives a word for each letter of the alphabet which we associate with Christmas and explains it in a friendly and conversational way. Simply and gently written, your little one will find great enjoyment in the words and pictures of this book, thus gaining more knowledge of the many symbols of Christmas in our world. Christmas. Even the very youngest children get caught up in the excitement–the gifts, the tree, and of course, Santa Claus–and to help celebrate and explain some of the season’s symbols, celebrations, and emotions, Saskatchewan writer Susan Harris has added to her shelf of children’s books with a new title, the brightly illustrated Christmas A to Z. It’s important to note that this is a secular Christmas alphabet book; Harris previously published An Alphabet of the First Christmas: A Christian Alphabet Book, as well as several other titles for young children. This is not a busy book, which will be appealing for those just learning to read, and for the adults who may be sharing this story with youngsters. The twenty-six alphabet pages contain little text, the letters and definitions appears in a large black font, and there is much white space surrounding the pictures. As a writer myself, I’m always interested in what alphabet book authors choose to represent each letter. In Harris’s book, A is for Antlers. They “look like sticks on the heads of deer but they are really bony growths,” we read and learn. On this page–and several others–Harris includes information that helps readers better understand the word selected to represent the letter. Bells are significant because “churches used to ring their big bells on Christmas Day,” she writes. The word for V is Village: “A village is a small group of houses in the countryside. ‘Christmas Villages’ are decorations which started off as nativity scenes but now include many different kinds of ornaments”. It’s easy to bemoan how commercialized Christmas has become, thus it’s refreshing to read–on the G page–that “A gift is something a person gives to someone else without expecting anything in return.” Q is always a challenging letter, and Harris wisely addresses it with the word Quaint: “Quaint means nice in an old-fashioned way”. And what of Z? “Zzzz is the sound of snoring while asleep. Happy, tired boys and girls fall asleep quickly after the excitement of Christmas Day.” Indeed they do. The last page features an image of an undecorated tree, and here little ones are invited to use their own imaginations with crayons or markers. Sharing this book with youngsters will merrily elucidate some of the symbols and practices surrounding Christmas. It may even increase excitement for The Big Day. Enjoy!